There are 34 Assisted Living Facilities in the Allison Park area, with 4 in Allison Park and 30 nearby. The average cost of assisted living in Allison Park is $2,960 per month. This is lower than the national median of $3,346. Cheaper nearby regions include Devon with an average starting cost of $2,800. To help you with your search, browse the 144 reviews below for assisted living facilities in Allison Park. On average, consumers rate assisted living in Allison Park 3.6 out of 5 stars. Better rated regions include Devon with an average rating of 3.8 out of 5 stars. Caring.com has helped 5 families in Allison Park find high-quality senior care. To speak with one of our Family Advisors about assisted living options and costs in Allison Park, call (855) 863-8283. Promotion ends in 257 days! Allison Park, Pennsylvania, is a suburb of Pittsburgh, so seniors have access to urban amenities in a suburban environment. Seniors seeking an assisted living facility (ALF) can choose between four in Allison Park and 31 in nearby communities. 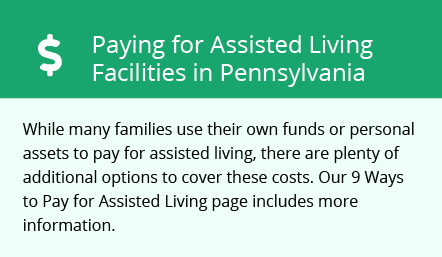 In Pennsylvania, these facilities are licensed as assisted living residences (ALRs) or personal care homes (PCHs), and they provide room, board and assistance with daily activities to four or more adults. Services vary by facility and the individual needs of each resident, ALRs provide nursing home or medical levels of care, while PCHs do not. The cost of living in Allison Park is 10 percent higher than the state and national averages of 100, due mainly to housing and transportation costs, so seniors on a budget may want to take this into consideration. Allison Park air quality is 57, which is 1 percent better than the national average of 58. This is based on an assessment of hazardous air pollutants calculated by the EPA. Seniors have a normal risk of developing respiratory illness and cancer risk compared to other U.S. cities. On average, it's sunny 162 days per year in Allison Park, which is less than the national average of 205 sunny days. Summer highs in July reach 83 degrees, while winter lows hit 21, making this a cold place for seniors preferring warmer weather. Violent crime in Allison Park ranks 6 percent below the national average of 31.1, and property crime ranks 24.4 compared to the national average of 38.1. Based on these statistics, seniors may feel a little safer on outings and while running errands. As a suburb of Pittsburgh, Allison Park is a member of the AARP Network of Age-Friendly Communities, meaning that its elected leadership “has made the commitment to actively work toward making their town, city or county a great place for people of all ages,” according to AARP. Pennsylvania is tax-friendly to seniors and the state exempts income from Social Security or from retirement accounts, including 401(k), IRA and pension income for seniors 60 and over. Assisted Living costs in Allison Park start around $2,960 per month on average, while the nationwide average cost of assisted living is $4,000 per month, according to the latest figures from Genworth’s Cost of Care Survey. It’s important to note that assisted living rates in Allison Park and the surrounding suburbs can vary widely based on factors such as location, the level of care needed, apartment size and the types of amenities offered at each community. Eligible seniors in Pennsylvania may be able to get help covering the costs of assisted living through an Optional State Supplement (OSS) to Supplemental Security Income (SSI) or a state Medicaid waiver. Pennsylvania is in the process of replacing its Home and Community-Based Services Waiver for Individuals Aged 60 and Older with the Community HealthChoices (CHC) waiver program. Allison Park and the surrounding area are home to numerous government agencies and non-profit organizations offering help for seniors searching for or currently residing in an assisted living community. These organizations can also provide assistance in a number of other eldercare services such as geriatric care management, elder law advice, estate planning, finding home care and health and wellness programs. To see a list of free assisted living resources in Allison Park, please visit our Assisted Living in Pennsylvania page. Allison Park-area assisted living communities must adhere to the comprehensive set of state laws and regulations that all assisted living communities in Pennsylvania are required to follow. Visit our Assisted Living in Pennsylvania page for more information about these laws.